SAN FRANCISCO (AP) Mac Williamson remade his swing during the offseason to become a more consistent power hitter. He added a leg kick, lowered his hands, found better balance all in an effort to keep the bat in the zone longer and give himself more room for error. 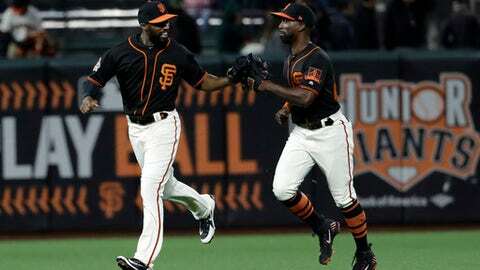 Williamson hit a two-run homer deep into the right-center field seats in the sixth, Buster Posey had a double and singled in the fifth to put San Francisco ahead, and the Giants beat the Washington Nationals 4-2 on Monday night. Williamson, playing his first home game at AT&T Park this season after being called up during the recent road trip, connected with a deep drive to right-center off Shawn Kelley after he relieved starter Gio Gonzalez (2-2). ”It’s another day in the life of my elbow,” Kelley said. ”What’s up Dusty, how you doing?” Strasburg said. Nationals: OF Adam Eaton, on the disabled list retroactive to April 9 with a bone bruise in his left ankle, won’t be rushed back until he is completely pain-free. ”When you see him in the lineup he’ll be ready,” manager Dave Martinez said. ”He’s coming along. When we get him back this time we don’t want any issues.” … OF Brian Goodwin remains in Florida with pain in his bruised left wrist. Giants: LHP Will Smith is eagerly anticipating his return from Tommy John surgery that cost him all of last season, and he could come off the DL as soon as Tuesday. He pitched twice for Class-A San Jose and three times so far for Triple-A Sacramento. He is scheduled to throw consecutive days for Sacramento on Wednesday and Thursday then another short outing Sunday. ”We’re close. We’re getting there,” Smith said, noting it will be ”awesome. I’m ready to go.” … RHP closer Mark Melancon (flexor strain in pitching elbow) is scheduled to play catch during Thursday’s off day. There is no timetable for his return.. … LF Hunter Pence (sprained right thumb) did some hitting and is scheduled for early batting practice Tuesday.